How do I warm-up ? 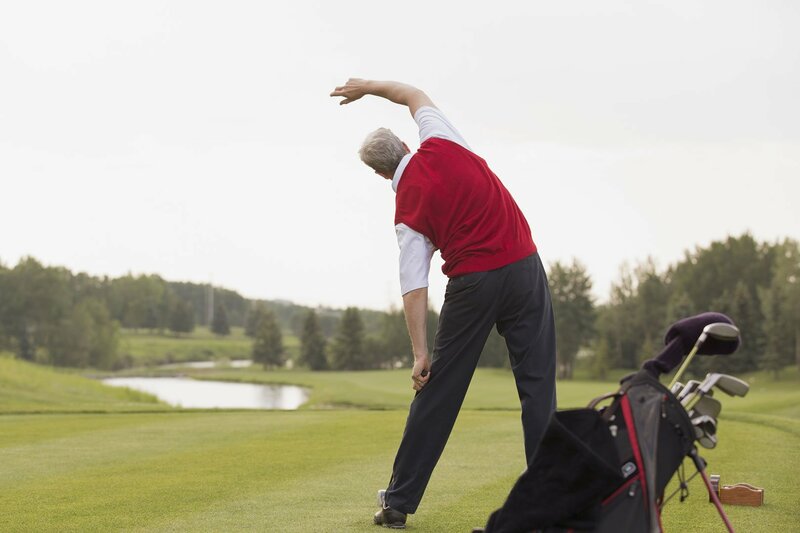 Be it golf lessons, a quick nine holes or a major championship, I make sure my body is warmed up and ready before I tee off. Long gone are the days of little to no warm-up before a round or range session. Since golf is growing in it’s athleticism, a few putts before your tee-off time just isn’t going to cut it anymore. If you want to be competitive, or get the most out of your golf lesson, a warm-up is pretty crucial. But what’s the best way to warm-up those golfing muscles? Hips & Shoulders – warming up your joints helps prevent injuries while improving your range of motion, or in other words – your shoulder/hip turn. Glutes – activating your glutes before a range session or a round helps with getting a little extra distance on the course. Core – stability in your middle section will help with your golf posture and promotes a stable foundation for the golfer’s swing. A quick warm-up that I like to do before a tournament starts with a lunge and twist. Begin with your arms folded in a cross across your shoulder and move into a normal lunge position. Once you are in this position turn your shoulders in the opposite direction of the knee that’s bent. This reflects what movement you need to make in your swing – a shoulder rotation while loading into your glutes. The second exercise I’d vouch for is a glute bridge. You might need to do this exercise in the locker room but trust me, it’s worth the couple of extra minutes. Start with your back on the floor and knees bent. Simply push your hips up towards the ceiling and hold for a couple of seconds, then lower down and repeat. This exercise warms-up your core and activates your glutes. If this exercise is too easy for you, try extending one leg straight out while keeping your hips elevated. Once these muscles are ready to go, it’ll help protect your back during your swing. The final way to warm-up is easy; hit golf balls. This might sound a little obvious but I didn’t realise how many golfers just walk straight into a golf lesson without hitting a few shots beforehand. As the saying goes; practice how you are going to play. Heading to the range, even it’s just for 20 shots, will help your body get ready to make some really good swings when it matters. The only thing I will say about this final tip is make sure you look at a range session as a warm-up for your body; don’t look for good shots. Treat it as an exercise and give yourself a chance to get warmed up! The information above is provided as advice only. You should seek advice from a professional before engaging in activities to prevent injury.